Again I found myself at the farmers market this weekend, and as usual was hoping to find a little dinner inspiration. I came with the intentions of a few tomatoes, maybe some lettuce, but in passing I noticed a basket of locally grown tomatillos. I’m familiar with these green tomato lookalikes, but I’ve yet to use them in my kitchen. There is no time like the present, so I picked up a couple of baskets from local Carlsbad Strawberry Company who attend the market weekly with a variety of interesting produce! I truly love Mexican food, and since tomatillos are commonly turned into salsa verde, thought we’d venture to turn it all into one deliciously healthy taco meal! 1 cup of tomatillos provides us with: 26% daily value of Vitamin C, 10% DV Potassium, and 10% DV of fiber. And at only 42 calories, you can eat your tacos with less guilt! Oh, but that’s not all, unlike tomatoes rich in lycopene, tomatillos offer a different & unique antioxidant known as withanolides, which have been shown to possess antibacterial & anti-Cancer properties. In addition to this, our tomatillos are rich in antioxidants like beta-carotene, zeaxanthin and lutein. I had no idea my salsa was so good for me! If only the same was true for the chips. Not only was making salsa verde on the agenda, I decided to piece together a meal with tons of bright flavors that was healthier than your average burrito. We’re turning to fresh limes, sweet onions & jalapeños to make this dish pop, and with a few other ingredients our menu was born! Here we have, Salsa Verde Chicken & Black Bean Tacos, with Roasted Corn & Zucchini Mix. Our recipe here covers the green salsa, in addition to our salsa verde chicken tacos, and the roasted corn mix. Time for dinner! In large mixing bowl combine EVOO, garlic EVOO, Paprika, wine, lime juice, S&P—whisk well. Add chicken tenders to marinade tossing to coat. Add chopped onion and jalapeño mixing well. Cover chicken mix with plastic and return to fridge until 10 min before ready to cook on stove. Remove husk and rinse tomatillos well in a colander. Prepare a large pot of salted water on stove, bring to a gentle boil. Add tomatillos and reduce to a simmer. Simmer tomatillos ~8 minutes (their green color will fade slightly, should be slightly firm still). Remove tomatillos from pot, rinse with cold water, drain well. Now add onion, cilantro, lime juice, sugar, garlic, and S&P - blend all till smooth. Transfer salsa verde into bowl with lid and chill in refrigerator. Preheat oen to 400 degrees. In small bowl combine, corn kernels, chopped zucchini, onion and 1 tsp EVOO, S&P—mix well. On a rimmed baking dish (lined with foil or greased), spread out corn mix evenly. Bake in oven for about 15 minutes, stirring halfway through. Place pan under broiler for about 4-5 minutes, until all is tender and starting to brown on top. In large non-stick skillet on stove, add marinated chicken tenders in a single layer, adding remaining marinade juice. Cook on medium low on first side for ~6 mins. Flip each tender and to top of each tender, cover with some of our salsa verde. Let chicken tenders cook until no longer pink (~7 more mins) *time may vary. In small pot on stove heat black beans. In another flat skillet on stove, heat tortillas till just warmed. Assemble tacos on each tortilla adding: black beans, corn mix, chopped chicken, queso fresco crumbles, SALSA VERDE & sour cream! This has a few components, but is pretty easy! The salsa verde is simple and can easily be made ahead. The chicken tenders cook quickly on the stove and so does the corn mix in the oven. 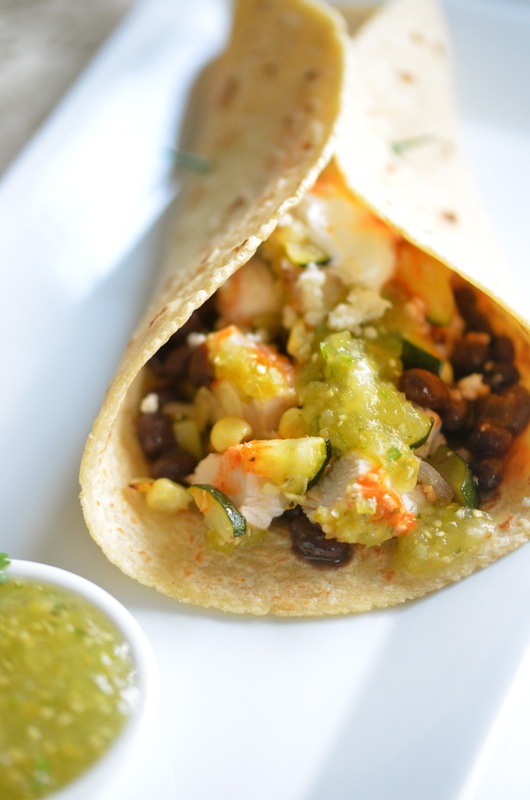 This is so flavorful, but healthier than your standard heavy tacos. Oh man, I have to say this was so flavorful & good! I ate more than my fair share, but it was worth it. I also have ample salsa verde leftover to use with chips, or on some shrimp taco salad I plan to make. The salsa verde stores very well in the refrigerator and is so easy, I think this might become a house staple! This is much lighter than some of my other favorite cheesy Mexican dishes. A great alternative for a vibrant and nutrient-dense dinner, with lots of protein, fiber and veggies. If you haven’t cooked with fresh tomatillos before, I recommend it. These are a nice alternative to everyday tomatoes and are easy to boil, roast or bake. I don’t think tacos can ever disappoint and these verde tacos surely didn’t!